Why is this More Than Bible Study? And what is this DiscipleMaking Companion Series? I have a passion to help Jesus raise up radical disciples, not just teach people Bible information (although information is necessary for the “more”). A disciple is a learner. Not merely a learner of information, but a life–learner & doer. My vision aligns with Jesus’ vision to “make disciples” (Matthew 28:20). So I call this series “DiscipleMaking Companion,” your companion as you take the truth of Scripture to encounter your daily life. These are “more than a Bible study,” not about accumulating information, although we will grow in our knowledge of Scripture. The Bible is God’s invitation into fuller life. We experience God’s offer through obedience-focused learning. Doing God’s Word reveals true knowledge. That’s one reason we have “flipped” the common learning process to first prepare and respond before we gather so we each bring fresh bread. provides a simple, flexible structure with a measured pace that releases freedom in learning and doing. This powerful, easy-to-use and reproducible approach builds deep relationships around Scripture with the Father, Son and Holy Spirit and with other group members. These eight incremental 5-week studies are more than the typical Bible study, although they include this. I designed these as your companion to accompany Christians toward personal LifeChange producing radical disciples who make other disciples on their spiritual journey. uniquely focuses innovative, cutting-edge learning theory on foundational books of the Bible to “get them under our belts,” yet in a way to impact our lives. Each week blends relational modeling, Biblical responsiveness and intentional God-assignments while also integrating intimate worship and an encouragement toward compassionate mission. Over time, these five great pathways to live out our daily God-assignments through the empowering of the Spirit develop radical followers of Jesus. Good habits form more quickly with such daily, incremental choices than with hit and miss “when-I-find-time” responses. Now a year is fifty-two weekly incremental steps toward LifeChange. …the primary factor common to all who have achieved great success is first laying a solid foundation through “deliberate practice.” “Deliberate practice” embraces the watchful eye of a competent coach as we respond to all the little things asked of us. …approach ultimately releases the greatest freedom and effectiveness. With Biblical responsiveness, approach the text as if you were there. Our inquisitive minds and our enlivened affections/emotions then trigger our will to activate truth in us and for others. Such a wholehearted “learning soil” aligns with our innate ability to learn creatively and so releases LifeChange out of the overflow of God’s life within. To this end, I encourage you to aim to read (or listen to) the weekly passage daily prior to the weekly meeting to develop lifelong habits that work for you. Rapidly reading the entire book once per week also aids healthy BIG-small-BIG natural learning. Mark up the accompanying Bible text and add your insights to the very helpful S-T-U-D-Y tool at the end of the material, if you wish. In time, you will want to download the Bible text yourself so you can personally discover the flow of the passage for yourself. Our Resident Teacher, the Spirit of God, partners with us to release life through active learning, if we give Him the chance. Begin with one DiscipleMaking Companion. I recommend the first one, but any works. Gather two or three others together and get started. These are all free PDF downloads because I long to see Christians reach toward their full potential for what God has promised us. I normally print these “Companions” 2/page,front/back (standard US size, 8″ X 11″). Also booklet format. The applicable chapter is on one side and S-T-U-D-Y on the back. This makes it easier for first-time people, or if some forget to bring their sheet. Also, one sheet is so simple, it does not overwhelm anyone). However, it should be formatted properly for “booklet.” Then the applicable chapter and S-T-U-D-Y are on facing pages (print front/back and staple). If you were to vote on a Spiritual Hall of Fame for OT Saints, who would be your first three inductees? Here are twelve of mine so we can look through through their lives and learn for ours (see 1 Corinthians 10:6+11 as a lens). Following are a number of other options to widen your grasp of Scripture beyond the eight-part foundational “DiscipleMaking Companion” series. BUT CHOOSE YOUR OWN BOOK AND USE A SIMILAR APPROACH. These use the same learning ideas as in the other “Companions,” and broaden us toward other key Bible books. This learning style can also be used on any books of the Bible your group chooses to study. John 13-17: Flourishing Spiritual Life (5 weeks) – Jesus’ “Upper Room” time with His disciples in John 13-17. Sermon on the Mount: A Journey in Healthy Relationships (5 weeks) – Sermon on the Mount, Matthew 5-7. Leadership Letters: A Journey as a Servant-Leader (5 weeks) – The Pastoral Letters, 1 Timothy, 2 Timothy and Titus. 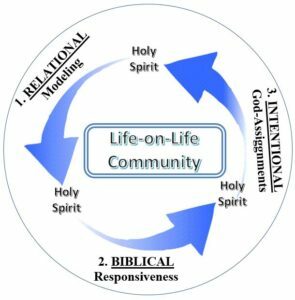 1 John: Authentic Life (5 weeks) – The book of 1 John is short, but packed with a dynamic, relational view of koinonia in community. See also booklet read-along on 1 John, Radical Mutuality. Proverbs: A Journey of Generous Stewardship (5 Weeks) – Proverbs as a distinct teaching on stewardship, owning nothing personally, yet using all God’s abundance for our Master. James: Wisdom for Real Life (6 weeks) – The book of James is direct, practical, life-impacting. James speaks to those who have wandered. He calls Jesus’ Bride back to the jealous heart of our Lover, even while challenging those of us who are all-in to live wholeheartedly for Him. Colossians: Standing Against the Tide (5 weeks) – This short, but powerful, book parallels are contemporary society. How can a church stay true to the Gospel and new life in Christ in a pluralistic society? Of course, no companion on a journey can automatically produce change in you. We must add our hard work to this God-breathed message (2 Timothy 3:16-17). I have interwoven cutting edge scientific studies on how people best learn and how our brain works so that our hard work brings more spiritual return. Now we can align with high-leverage learning that shapes and forms us. To this end, I encourage each of you to aim to read (or listen to) the weekly passage daily prior to the weekly meeting to develop lifelong habits that work for you. Rapidly reading the entire book once per week also aids healthy BIG-small-BIG natural learning. Either mark up the text downloaded from a Bible app or use the very helpful S-T-U-D-Y tool on your own as an active learner. Take extra effort to put this into daily practice in your life, the key to growth. Then you will also bring fresh bread for the group. Developing good habits forms more quickly with daily, incremental choices than with hit and miss “when-I-find-time” responses. I offer two-levels of engagement to learners in “DiscipleMaking Companion,” depending on time and desire to invest, and what we want out of our time. Let me give you a few thoughts about these “Companions” that are designed to be more than a Bible study, just to whet your appetite. These ideas naturally braid themselves throughout the learning, virtually invisible except to the perceptive eye. First, each of the first eight “Companions” are only 5-weeks long. The short commitment makes it easier to challenge others to enter in with you. It’s easy to re-up once we have experienced change in our lives. Second, each DiscipleMaking Companion goes through one book of the Bible or an extended passage. We get directly into Scripture itself, soaking in one chapter each week. God designed our minds to learn like this, rather than gathering scattered bits and pieces from all over. When we study geography, we first look at a globe, before focusing on one continent, then the rivers, mountains and plains. We learn best one layer at a time. Third, our minds learn best when we have clear categories under which to file new information. Each companion for DiscipleMaking has one major category or theme to help our minds retain in a way we can later access. Fourth, if we only read or listen, learning retention is 5-10%. This accelerates to 70% if we respond to what we learned, and up to 90% if we also pass along what we learned to others. Fifth, every companion for DiscipleMaking begins with one thing each group member is grateful for. A thankful heart lifts our thoughts God-ward and prepares for insight. Can a Genuine Christian Lose our Salvation? Did the Father Abandon His Son on the Cross? Absolutely NOT! I’m simply joining a stream of others in this God-fueled restoration of a more relational view of the Triune God. I desire to impact every aspect of our lives with this relational Trinitarian view of God’s design for humanity as His centerpiece. The incarnation of Jesus then provides a way back into the life God planned as His new creation, a living model of how to walk this out and also reveals who His Father is. How indescribable is the beauty of Jesus! This worldview or mental map releases God’s stunning vision of a high view of redeemed and restored humanity, while also recognizing that we are all still very much in-process. I’m writing to those who long to be radical followers of Jesus, who couple the necessary hard work with God’s grace to partner toward LifeChange and ministry. This website is dedicated to seeing God like He really is in order to see ourselves and our world the way God sees. God is always active and involved in His creation since this world is the theater of His glory. He simply invites us to join with Him in His epic adventure through faith in Christ to make disciples who multiply, a mutual indwelling, He in us and we in Him (John 14:20). Then we begin to see ourselves the way God sees us, which changes how we view and interact in this world. Regularly ask ourselves these three, essential questions. Coming alongside as a catalyst to help others make a difference as we engage the world with Christ.